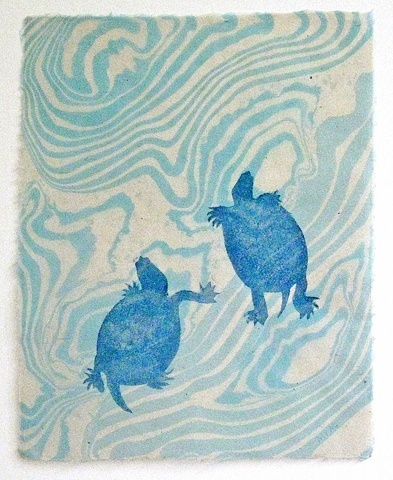 David Carroll's writings about and drawings of turtles inspire a series of paper turtle prints, including this one. I sprayed pigmented cotton pulp through a stencil onto a base sheet of kozo to form the turtle images. To make the "waves," I added Japanese marbling, suminagashi, to the dried turtle-stenciled paper. Variations in the turtle images and in the marbling makes each paper in this series unique. Nancy Morains of Colophon Book Arts taught me the marbling technique in a 2008 workshop at Paper & Book Intensive, an annual "working sabbatical" for book artists, conservationists, and papermakers.